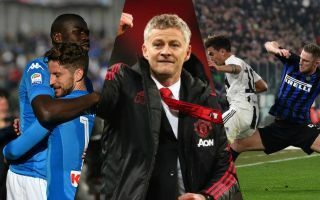 Manchester United are reportedly ready to cash in on Marcos Rojo and make some big changes in their defence with potential transfer swoops for Kalidou Koulibaly, Milan Skriniar or Eder Militao. The Red Devils have not had the most convincing defensive displays for much of this season, even if results have improved since Ole Gunnar Solskjaer replaced Jose Mourinho as manager. It still looks as though some big names could be on their way in and out of Old Trafford soon, as Rojo’s sale could help fund the club’s move to majorly revamp their defence. According to the Telegraph, United’s top target is £90million-rated Napoli centre-back Koulibaly, but they are also looking at Inter Milan ace Skriniar (£63m) and Porto youngster Militao (£45m). It has previously been suggested that MUFC could make more than one signing at the back, so it’s perfectly possible flops like Chris Smalling, Phil Jones and perhaps even Eric Bailly will also be heading out of Manchester in the near future. If so, United should have plenty to spend and could potentially splash out close to £200m on new defenders, not unlike Manchester City did when they signed three full-backs ahead of their title win in 2017/18.